Get Fit Series: 10 Minutes to Your Best Abs Ever! No time? No problem. You only need 10 minutes a day to work toward a flatter stomach. But six-pack abs are only part of the story. Your abs are part of your core, the body’s center of gravity that also includes the muscles surrounding your back, pelvis, and hips. So, as a bonus to getting a tight stomach, you will also improve posture, spinal alignment, and stability. 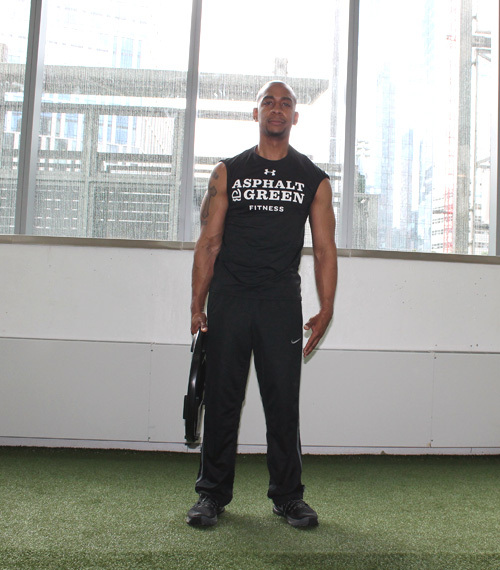 Asphalt Green personal trainer Gerre Bettis shares his favorite core-strengthening workout. The best part? You will be in and out of the gym in 10 minutes. Or, if you have more time, tack it on to the beginning or end of your regular routine. Repetitions: Three sets of 15. Fourth set: Complete as many repetitions as you can until you feel fatigued. Rest for 30 to 60 seconds between each set. Lie face down on a hyperextension bench letting your upper thighs and lower hips rest on the support pad. Your waist should be able to bend freely. Make sure your body is straight from head to toe. Holding a heavy weight plate, fold your arms across your chest. Steadily bend your body forward as far as you can without rounding your back. Squeeze your abdominals and back muscles to rise to starting position. Easier: Do not use a weight plate. Place your fingertips to your temple to perform the exercise. Harder: Use a heavier weight plate. Repetitions: Four timed sets, 30 seconds each. Rest for 30 to 60 seconds between each set. Lie on your back on a bench with your legs straight in the air. Use both hands to grip the bench above your head. 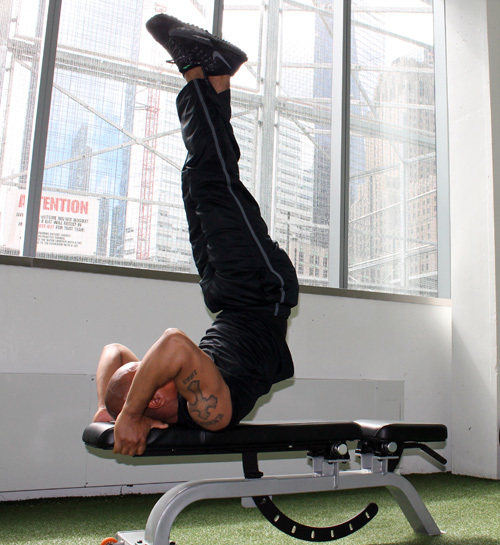 Lift your hips off of the bench, driving your legs up toward the ceiling. Slowly and with control, lower your hips back to the bench and repeat. 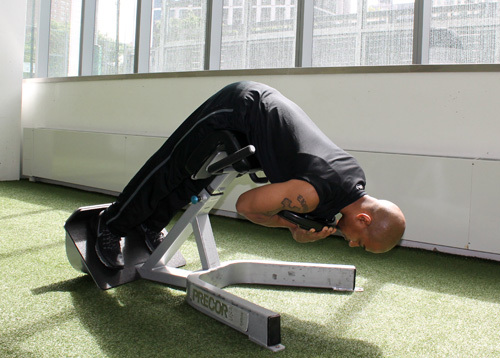 Easier: Bend knees between hip raises. Harder: Add a twist at the hips when your drive your legs up toward the ceiling. Repetitions: Three sets of 15. Rest for 30 seconds between each set. 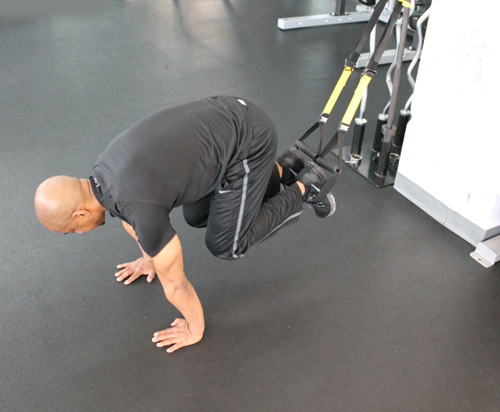 Start with your feet placed in the handles of a TRX® training system. 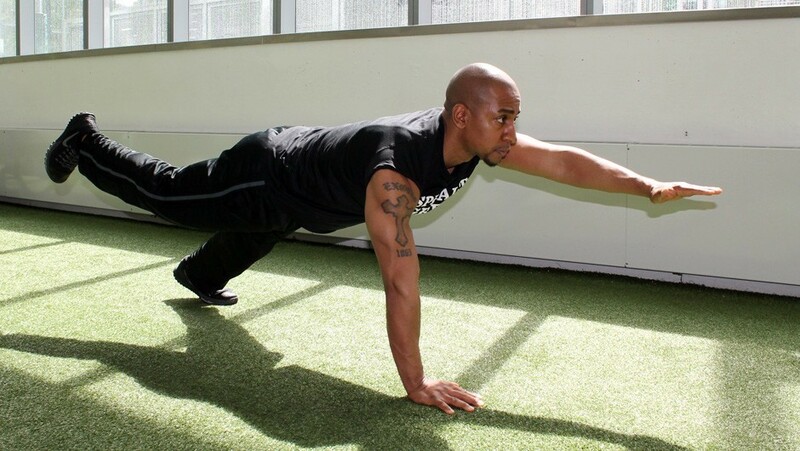 Lift your knees and place your hands in line with your shoulders (pushup position). Easier: Bring your knees to the floor after each repetition. Harder: On the third set, alternate bringing the knees to your chest, right shoulder, and left shoulder. 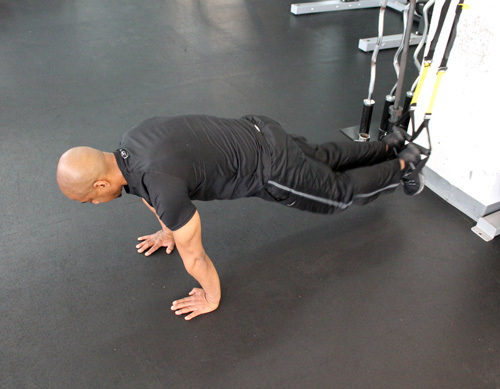 Repetitions: Two sets of 10 on each side, alternating. Third set: Complete five repetitions on each side, holding extension position for 10 seconds. Rest for 30 to 60 seconds between each set. 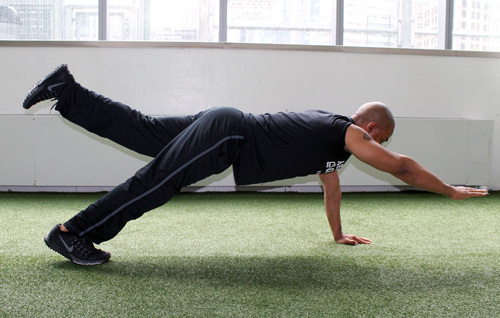 Start in high plank position, arms in line with your shoulders. Your body should form a straight line. Squeeze your abs and glutes, and extend your right arm forward at shoulder level while simultaneously lifting your left leg off the floor. Return to starting position, and repeat on the opposite side. Easier: Place your knees on the mat. Harder: Perform the exercise holding a light weight. Repetitions: 15-20 repetitions per side. 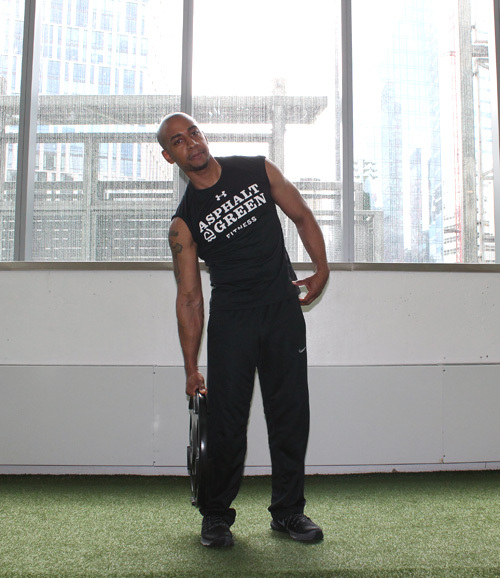 Stand with feet shoulder-width apart, and hold a heavy plate or dumbbell in your right hand, palms facing your torso. Slowly bend down at the waist to your right side, keeping your back straight. Hold for a second, return to starting position, and repeat. Easier: Use a lighter weight or only body weight. Harder: Use a heavier weight. Repetitions: Two timed sets, 30 seconds each. 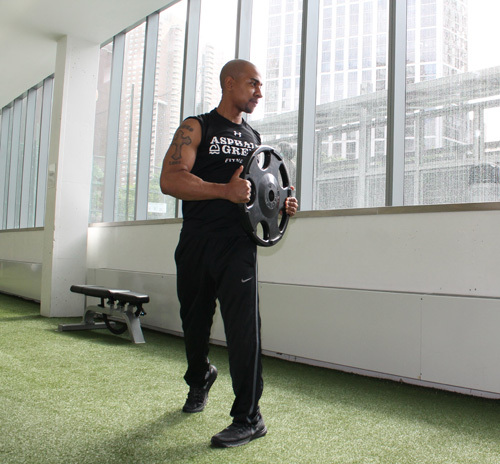 Start with feet placed slightly wider than shoulder-width apart, holding a heavy plate or dumbbell at your chest. 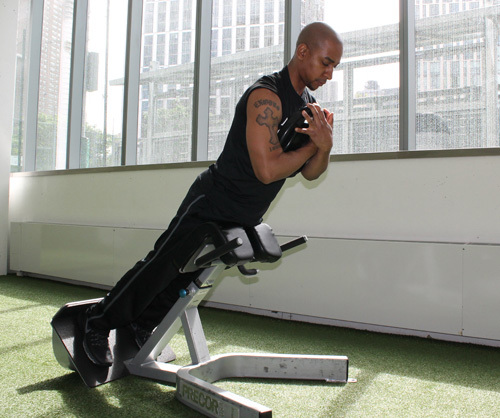 Rotate your torso from left to right, keeping the weight tight to your chest. Easier: Use a light or medium weight or only your body weight.